This is the world famous low-carb, ABC bun-less burger (well OK, world famous in our house). Come and see what all the fuss is about. It’s grain free, gluten free, unprocessed and can be made in under 15 minutes for the whole family. 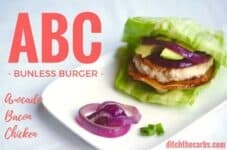 So what is an ABC bun-less burger? Yes, it’s that simple, but calling it an ABC bun-less burger makes it easy to remember. Maybe it might catch on and we will see it at our local burger joint soon. Bun-less burgers are quick, healthy, grain free, wheat free and a perfect mid-week family meal. It can be ready in 15 minutes. Serve with salad or coleslaw with homage mayonnaise, and you have a perfect meal. ABC bun-less burgers are easy to remember an even easier to make for dinner tonight. Naturally gluten-free and so healthy and nutritious. Mix the ground/minced chicken with the spring onion, garlic and egg. Divide the chicken burger mixture into 4 equal portions. Shape with your hands into burger patties firmly. Heat oil in the frying pan. Add the chicken burgers and fry gently on both sides until golden and cooked through to the centre. At the same, fry the onion rings and bacon. Lay one lettuce leaf on a plate. 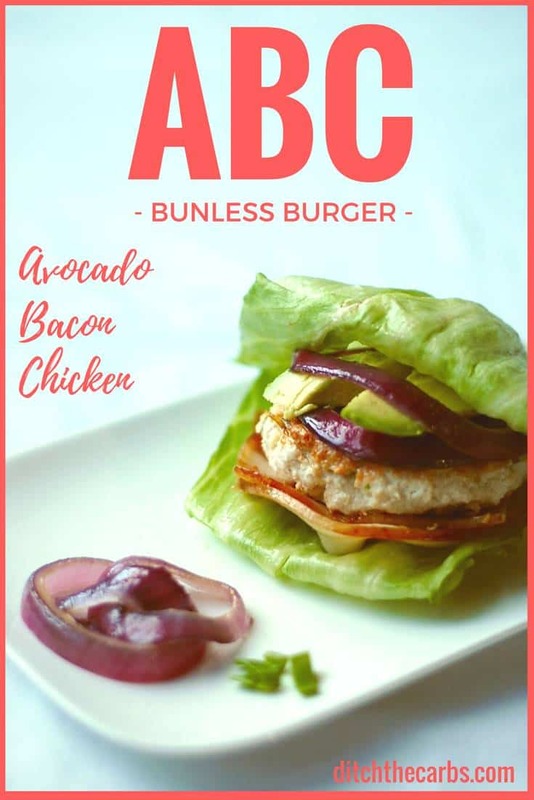 Make the ABC bun-less burger by placing the bacon, the chicken, avocado and cooked onion rings. Fold the lettuce leaf over to become the lettuce "bun". Love this! But confused – everything divided into 4, but serves 5!?!? !